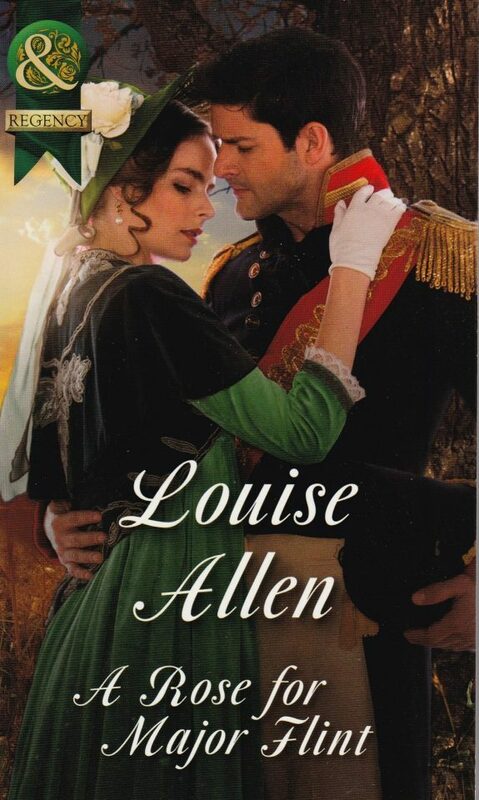 He found her on the battlefield – but who is the woman who is stealing his heart? 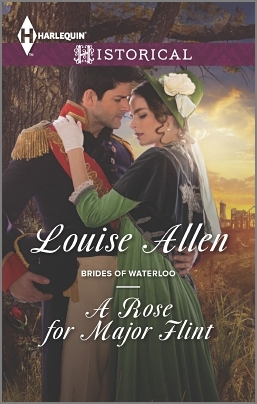 A Rose For Major Flint is one of three novels featuring three officers in the artillery unit known as Randall’s Rogues, fighting at the Battle of Waterloo. The others in the set, which may be read in any order, are A Lady For Lord Randall by Sarah Mallory and A Mistress for Major Bartlett by Annie Burrows. Major Flint is a hard, battle-weary officer with no time for the softer things in life, let alone romantic attachments or marriage. His birth means he’ll never attract a lady, but perhaps the camp-follower he finds on the battlefield at Waterloo, terrified into speechlessness, could be the woman for him. But when the woman he calls Rose finds her memory and her voice he knows she is not for the likes of him. Rose has other views on the matter and Flint finds himself in a battle he does not want to win. The noise in her head hurt so much. She lifted her hands to try and clutch at it, squeeze it out, make it stop. Then she could think, then she would know what to do about… them. Her arms wouldn’t move. She looked down to the imprisoning briars, then up at what was coming towards her across the muddy, shell-ripped ruin of the spinney. This was real and this was Hell and so those were demons. They laughed as they came, four of them, blood-soaked and mud-smeared, wild-eyed and ragged, baying like hounds on the hunt. She knew what they wanted, what they would do to her, even if she knew nothing else. Not her name, not how she had lived before this nightmare had begun, not how she had come to be here. She opened her mouth to scream but nothing happened. Go away. Help me, someone. Help me… Nothing. Only the sound of her heartbeats racing. Only the sound of their laughter and the words that made no sense as they hit her like fistfuls of slime. She closed her eyes, stayed in the darkness with the screaming in her head, the screaming from the demons, the Devil’s roars. She would be next. She had sinned and this was Hell. The woman was tall and slim and her hair, where it was not wet and matted, was a dark auburn. Rose petals had fallen from the briar that held her. They were fragile, pale pink, incongruously beautiful on the ripped, soaking fabric of her gown, the tangle of her hair. Long lashes fanned over white cheeks and her mouth was slightly open. He could hear her breath coming in short, desperate pants like a trapped animal in a snare. She had bitten her lips and the sight, amidst so much carnage, touched him despite his defences. Angered him. ‘Let’s get you untangled.’ Flint kept his voice calm, used the firm tone that would steady an injured man. The briars tore at his hands, added to the bruises and cuts, the little rips of pain reminding him he was alive. After three days of hell, who would have thought it? When he got her free she just stood there, swaying. Flint touched the back of his hand to her cheek, leaving a smear of blood on the cold skin. She flinched but her eyes opened, wide and dark, the pupils so distended he could not see the true colour. Still she stood there, a breathing statue. She must be a camp follower, but he couldn’t leave her, not here. Her man, if he was still alive, would never find her, but others would. Flint put his arm around her, ignored the way her body shuddered at the touch, bent and swept the other arm under her knees to lift her against his chest. Pain stabbed from the sabre cut in his right side. The blood must have dried into his shirt and lifting her had ripped it open. He ignored it. After a moment her arms slipped around his neck and she clung as he crossed the glade, stepped over the bodies. She was a reasonable armful, Flint thought as he found the track again and made for where he had left the men. Slim but not skinny, curved but not buxom. Feminine. Any other day he’d enjoy the feel of her against his body, but not now. Not here.